It’s been just about six months since my name was announced during the Gold Circle Awards competition as the Property Manager of the Year for 2012. Without question, I was thrilled to be selected for this prestigious honor, especially considering the many other outstanding men and women who were nominated last year. 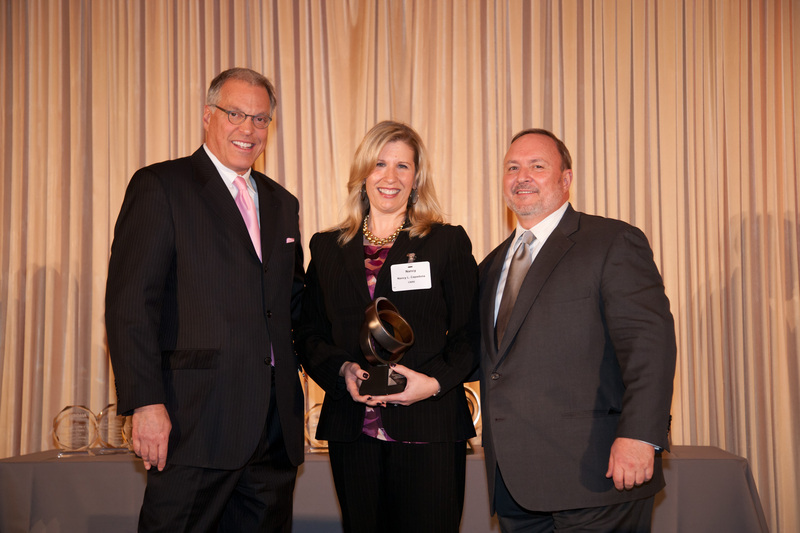 Nancy Capadona accepts the 2012 Gold Circle Award for “Property Management Professional of the Year” with Larry Cohn (left) BOMA/Chicago Information Committee Vice Chair and BOMA/Chicago Executive Vice President Michael Cornicelli. But along with the personal honor of earning the Gold Circle award, I maintain that the single greatest reward gained was the validation and an overwhelming sense of recognition from my industry peers for the work I’ve done as a property management professional. For the record, I’ve just celebrated my 20th anniversary in the business. Individual recognition awards such as the Gold Circle are tremendous because they benefit both the people who are competing and the organization itself. For those nominated and for the eventual winner, the competition is another tangible way to justify all of the hard work that goes into managing commercial real estate – you get noticed from all of the people you work with every day, from professionals at other real estate companies and from our Affiliate members. And for BOMA/Chicago, the Gold Circle Awards highlights the talented and dedicated individuals who make up the organization. Their individual accomplishments are a true reflection of the caliber of BOMA/Chicago. Quantify and qualify your accomplishments. Point out how your efforts to save on electricity resulted in lower energy costs – and be specific about the dollar amount. Review the application itself and the key points. This way, you won’t get tripped up when answering a question. I speak from personal experience in saying that receiving a Gold Circle Award is an accomplishment to be proud of for the duration of your career – in fact, I keep my Property Manager of the Year award displayed prominently at the front of my desk in my office. I strongly encourage all of you who know a worthy BOMA/Chicago colleague to consider nominating him or her for this year’s Gold Circle Awards. Help that individual and their company gain the recognition they deserve.